Garage door problems can be more than an inconvenience, they can be dangerous. A garage door is a primary entrance into your home. When it breaks your movements may be limited. It can trap a vehicle inside when you need it, or get stuck open, leaving a major entrance vulnerable to intruders. Garage door repair in Camas begins with Coast to Coast Garage Doors. Choose the affordable local garage door repair company. We keep our prices low and we never perform work you don’t need. Camas is our home, and we’ve built our business on trust and honesty. If a repair is simple, fast, small, or all three, that’s what we do—we don’t sell “hidden” problems or maintenance concerns that aren’t necessary. 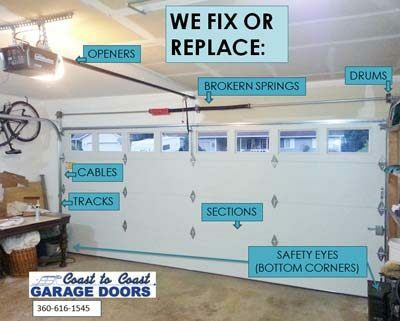 Garage door repairs right to your door. We guarantee our work will be completed correctly the first time. In order to make the process as efficient as possible, we keep our repair trucks stocked with the parts that most often require replacing. Our technicians work with technical precision to deliver dependable repairs while getting your door moving again. Don’t get stuck with another company. With local garage door repair in Camas since 2009, call (360) 616-1545 or contact us and experience true small town service without the chain store price hikes.